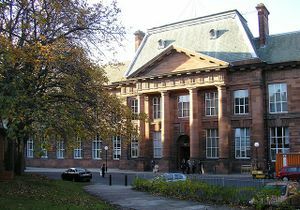 The Edinburgh College of Art (ECA) is located in Edinburgh, Scotland. Students are taught a broad range of animation techniques, synthesising classical animation with innovative technologies that results in a distinctive digital/analogue hybrid. Students work very independently on projects, though teachers are always around to give feedback if asked. The ECA is also initiator of the "10x10x10" challenge, taking place every January, in which animators make 10 short animations in 10 days with music composition students adding soundtracks to their work. This page was last edited on 18 December 2018, at 00:46.